2014-2017 C7 Corvette Trunk Lid Brace. 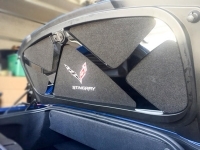 Fits 2014-2017 C7 Corvette Convertibles. Want to really show off your Convertible Corvette at the next event? Customize the look of your trunk with our Stingray Trunk Lid Brace and you'll have one more reason that your convertible trumps the coupes. Each of our trunk braces are handcrafted, so you know you're only getting the highest quality parts that are always made in the USA. Includes all materials for installation. 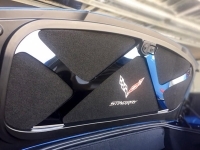 Log In To See Pricing 2014-2017 C7 Corvette Polished Trunk Lid Panel With Brushed Plate. Fits C7 convertibles only.